The foundation of current Casco Bay Island Transit District (Casco Bay Lines) schedules dates back to well over 50 years ago. Since that time, Casco Bay Lines has only made schedule changes in an ad hoc fashion in response to isolated concerns. Over time, the system has grown increasingly inefficient and has likely resulted in increased operating expenses and lower customer satisfaction. As part of a long-range strategic planning process undertaken by the Casco Bay Lines Board of Directors (Board) between 2015 and 2016, the Board agreed to a number of goals and priorities, one of which was to conduct an analysis of the existing schedules to determine whether new service schedules should be implemented in order to improve both efficiencies and customer satisfaction. The Board developed a Project Overview Statement and a special advisory committee to guide this work. The Schedule Advisory Committee was structured to include members of the Board, staff and general public representing the islands served by the ferry system. The Board agreed on goals for any new schedule considered, including that it should improve transportation options for residents, tourists and other visitors, be presented in a manner that is user friendly on paper and online, include a documented process for future schedule changes, improve efficiencies and not result in an immediate fare increase. The Board determined that the process of creating the new schedule must consider Collective Bargain Agreements, fleet composition, existing facilities, preserve all major lines of service and include robust public participation. In April 2017, Casco Bay Lines issued a Request for Proposals (RFP) to identify a marine transportation consulting firm to conduct the analysis and make a recommendation to the Board. Four firms submitted proposals, two were short listed for interviews and KPFF from Seattle, Washington, was selected. 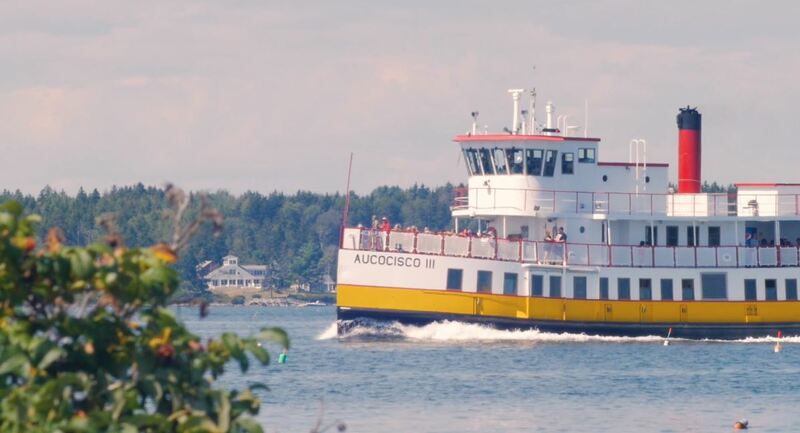 Casco Bay Lines entered into a contract with KPFF in July of 2017 and they immediately began the work of gathering information on ridership, freight, vehicle and financial data, as well as learning about the existing schedule and the current fleet of vessels. The Schedule Advisory Committee met to kick-off the project in a public meeting in July 2017. Working with KPFF and the Schedule Advisory Committee, Casco Bay Lines issued a public survey to gather stakeholder input anonymously to inform the process. The survey, focused on various aspects of the sailing schedule and ferry usage, was open online from August 24 to September 15, 2017, and was promoted via Casco Bay Lines’ email list, other email lists used on the islands, the Casco Bay Lines website, posters, and an open house at the Terminal on August 29. Paper surveys were also made available. At the survey’s close, there were 640 total responses. The team then held public meetings on Peaks Island, Little Diamond Island and Great Diamond Island on September 26, and Long Island, Cliff Island and Chebeague Island on September 27th, to solicit additional input and discuss preliminary analysis of the survey results. A schedule advisory committee meeting was held in the Spring of 2018 to review final analysis in advance of a Board meeting where findings and potential recommendations were presented to the Board. Additional public meetings were held on May 23, 2018, at the Terminal, June 5, 2018, on Peaks Island, Little Diamond Island and Great Diamond Island, and June 7, 2018, on Long Island, Cliff Island and Chebeague Island to discuss progress and seek additional feedback on potential schedule changes. Throughout, input from the public has been a critical component of the analysis. Through the survey, public meetings, and outreach directly to staff, the needs of all ferry riders, as expressed through their feedback, have been seriously considered at every juncture in this process to ensure, to the greatest extent possible, that new schedules meet the needs of the entire community while understanding it would be virtually impossible to meet the needs of every individual. Ultimately, the goal of the project is to continue to constantly improve service through purposeful change while also balancing the viability and sustainability of the Transit District. We are passionate about our mission to serve Casco Bay’s island communities and visitors with year-round passenger, freight and vehicle ferry service and we look forward to doing so for generations to come. As of November 2018, Casco Bay Lines continues to work with KPFF to complete final updates to proposed new service schedules. Once complete, Casco Bay Lines will provide another opportunity for the public to comment before any final recommendations are made and presented to the Schedule Advisory Committee and the Board. A vote of the Board is required for final approval. The current 2018-2019 winter schedule will be in effect until April 13th or until the Board approves any new schedule for 2019. We will continue to post updates in our enewsletter, on the Casco Bay Lines website, and on our Facebook page so please subscribe/follow these to ensure you receive information as it is updated.